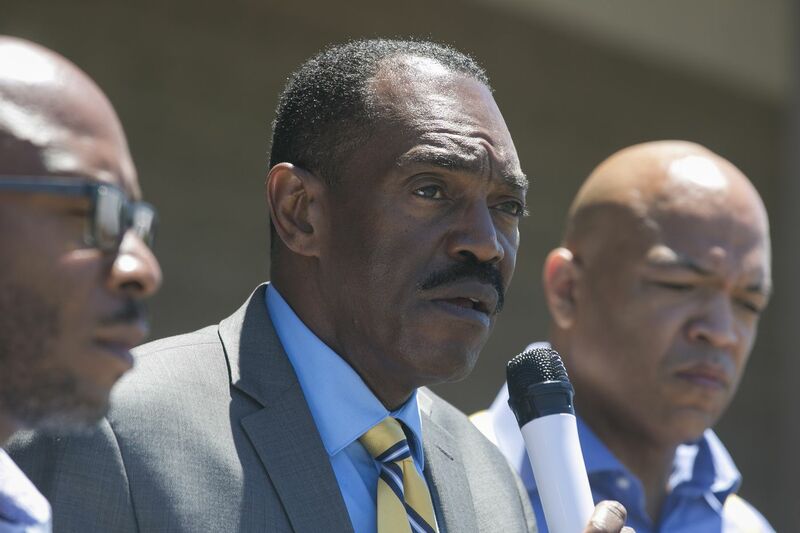 Philadelphia NAACP President Rodney Muhammad lobbied for Mayor Kenney’s soda tax, but didn’t initially disclose that fact. Mayor Kenney has always painted the supporters of his soda tax as grassroots activists. When the state Supreme Court upheld the tax on Wednesday, Kenney thanked the "thousands of advocates and everyday people outside of this government" who "were vocal and forceful in their support" of the programs funded by the levy. "This was our army of unpaid lobbyists," Kenney said. But the mayor's characterization of the pro-soda-tax forces was complicated by a ruling less than 24 hours later. On Thursday, the city's Ethics Board issued $8,000 in fines against Philadelphians for a Fair Future and companies that worked for it for making "material misstatements and omissions" in their lobbying disclosure reports. PFF is a nonprofit with ties to Kenney that promotes the soda tax. According to a settlement with the Ethics Board, PFF did not list the lobbyists or report some of the money they were paid to push for the controversial tax after Kenney proposed it in 2016. Minister Rodney Muhammad, president of the Philadelphia NAACP, was one of two lobbyists who failed to register that year while doing work to advocate for the soda tax on behalf of PFF. Three firms also didn't register. PFF described the lack of disclosure as "inadvertent" and stressed in a statement that it has been transparent about where its money comes from, if not how it was spent. "At no time was PFF or its consultants engaged in any effort to hide or obscure its objectives or its strategies for achieving them," the group said. Muhammad, who was not personally fined, said he already had been looking into the soda industry's advertising in minority neighborhoods when he was approached with the lobbying offer. "I thought about it and said, 'What the heck, I'm going to keep doing it anyway,'" he said. Muhammad said he didn't know he had to register as a lobbyist for that work until the Ethics Board came calling. He registered in April — six, um, months after Clout first reported in 2017 that he had been paid to promote the soda tax. "If you tell me what I need to do, I'll do it," Muhammad said. "I didn't have anything to hide." An $8,000 fine barely rates a splash in the ocean of money poured into lobbying efforts for and against Kenney's soda tax, which since January 2017 has added 1.5 cents an ounce to the cost of most sugary and diet beverages sold in the city. The American Beverage Association has reported spending almost $16 million between January 2016 and March 2018. PFF said it spent $2.8 million in the same period, meaning the pro-soda-tax forces are being outspent by more than 5-1. Muhammad also works as a consultant for Kenney's political action committee, collecting $45,000 for those efforts in 2017. Those payments were listed as going to Rodney Carpenter, whom Clout had never heard of until we Googled his address — and realized it was the mosque led by Muhammad. Yes, Rodney Carpenter and Rodney Muhammad are one and the same. Democrat Rich Lazer had the support of some of Philadelphia's biggest power players in his 2018 congressional campaign, namely Mayor Kenney and influential Electricians union leader John "Johnny Doc" Dougherty. Less known was the financial backing Lazer was getting from two groups close to George E. Norcross III, the dominant Democratic power broker in New Jersey. It's the latest sign that Norcross is staking out ground in Philly politics and teaming up with Dougherty. Norcross met with Kenney the night he won the mayoral primary in 2015. Middle Class PAC, the super PAC created by Dougherty to promote Lazer, received $100,000 from the General Majority PAC and General Growth Fund. Norcross has raised money for the General Majority PAC. Public records show that the PAC and General Growth Fund, a nonprofit, share a post office box in Trenton. Lazer, a top aide to Kenney, finished third in the May primary for Pennsylvania's Fifth Congressional District, based in Delaware County and South Philly. The Electricians union has been generous to Norcross' friends. The union's PAC contributed $100,000 last year to New Jerseyans for a Better Tomorrow, a super PAC that worked with General Majority to help reelect Democratic State Senate President Steve Sweeney. Sweeney, a top Norcross ally, had faced an onslaught of negative ads paid for by New Jersey's largest teachers' union. And last month, the Electricians gave $10,000 to General Majority. Did Rep. O’Brien pull a bait-and-switch on voters? During this year's primary campaign, Clout heard a juicy rumor: Democratic State Rep. Mike O'Brien was going to withdraw from the election after the May 15 primary and, with the help of ward leaders, anoint chief-of-staff Mary Isaacson as his successor. By waiting until after Primary Day to exit the race, the theory went, his protege wouldn't have to face an opponent. O'Brien defeated Democratic challenger Debby Derricks in the primary, but no Republicans are running against him. Sure enough, City & State PA reported that O'Brien filed paperwork this week to remove his name from the November ballot, citing health issues. That leaves it up to the district's ward leaders to decide whom to put on the ticket to replace him. Michael Boyle, Democratic leader of the Fifth Ward, then announced that he would nominate Isaacson to run. Isaacson said she had heard the scuttlebutt before the primary about a potential candidate switch amid talk about O'Brien's health, but insisted there was no plan until a recent doctor's appointment showed a "path to recovery that was longer than he expected." "This has been going on forever," she said of the rumors. "Just because he's gotten older and the district has gotten younger, it's become more prevalent. And that just feeds the rumor mill." In a sign that the city's Democratic Party might be changing — at least a teeny-tiny bit — newly elected officials are crying foul over the fact that the meeting at which ward leaders will officially pick O'Brien's replacement was scheduled for Monday. That's too soon for Democratic committee people to weigh in, they argued. Neil Makhija, a committee person in the Fifth Ward, said there's "no need for a rush." Nikil Saval, who was elected to lead the Second Ward this spring, said "it's important for more people to be involved in this process than five ward leaders." Isaacson said the meeting was called for Monday because the wards have three weeks to select a candidate, give that name to the city's Democratic Party, have that approved by the state party, and then submit it to the Department of State. We asked Isaacson if there were any other potential candidates. "I'm not going to make any candidates by naming them," she said, demonstrating the political savvy that likely will send her to the state House.